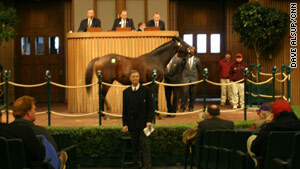 This year's Keeneland Auction brought in less than $24 million -- down 27 percent from last year. Lexington, Kentucky (CNN) -- If thoroughbred race horses are the oil of Kentucky, then Lexington is OPEC and the Keeneland Auction is its commodity exchange. Four times a year on this 1,000-acre racing grounds and sales facility, the buyers, breeders, and high stakes investors gather to take the biggest gambles in horse racing -- purchasing millions of dollars in breeding and racing stock. In racing vernacular, the market for thoroughbred prices in 2009 didn't win, place, or show. And this week at the industry's first notable sale, things have been slow coming out of the gate -- at least by the big-ticket standards of those who can afford to dream of owning the next Secretariat or Seabiscuit. Yes, a tight economy has worked its way up to the upper-crust world of thoroughbred ownership. The five-day sale, which ended Friday, brought in about $23.9 million -- down 27 percent from last year's six-day gross of $32.8 million. The auction in 2008 brought in more than $70 million. "I had executives who had the cash tell me they couldn't afford being seen buying a thoroughbred while they were sitting in a union negotiation during this economy," says Keeneland President and CEO Nick Nicholson. At center stage beneath the auctioneer's podium on Monday stood Distorted Passion, a 5-year-old mare who finished her racing career with five wins in 18 starts. In a room lit like a TV studio, with video streaming on the Internet and nine cameras to watch the auction in case there is a dispute, an auctioneer barks out syllables until gaveling bids to a close and announcing a final price of $400,000. The bid fell short of Distorted Passion's unannounced reserve price -- and was $75,000 less than she sold for two years ago. She went back to her owner, setting a grim tone for the week's proceedings. "The market is soft," said Tommy Thornbury, associate sales director at Keeneland. "There's been some overproduction. We saw it coming for some time. Hopefully we're seeing the bottom." None of which is to say that the big-name buyers weren't in Lexington looking for bargains. Thornbury pointed out Rosendo Parra, the former Dell executive. Celebrity chef Bobby Flay sat in a press box reading transaction sheets. Somewhere in the seat of cowboy hats, caps, boots, and thermal underwear was country singer Toby Keith, looking to buy horses of his own. "You see that guy over there. He's the biggest casino operator in Argentina." Thornbury said, smiling. Keeneland's sales team traveled to 48 countries to drum up interest in its auctions. And as the U.S. and world economies "reset," Keeneland officials say they see some emerging markets for their stock. The Russians are getting into the racing game -- quietly. The staff here gets wide-eyed when they talk about the potential for a Chinese racing industry. Walking in the January the snow between barns and the sales pavilion, one can hear conversations in Japanese, Spanish and Irish brogue. James "Mouse" Mullins, a horse handler who has been in the business for 44 years, has his own explanation for the slow spending at the auction. "The King isn't here," he said. "And if the King isn't here, they're not spending money." "The King" is Sheik Mohammed bin Rashid al-Maktoum, the Emir of Dubai with arguably the deepest pockets in horse racing. He's the man whose name is synonymous with the extravagant building boom of the last decade in Dubai, the man who oversaw the building of the world's tallest skyscraper. He is royalty in the horse-auction business as well. When he or his representatives show up, a sale becomes an event. Mouse knows this. The emir's Kentucky farm, Jonabell, sits just five minutes away from Keeneland. His goal? To build the perfect horse -- and to let anyone else try if they're willing to show up and pay six-figure stud fees for champions like Street Cry and Megdalia D'Oro. "He does purchase the very best," said Mike Akers, chairman of Dapple Bloodstock and Investment. "He can come in [to an auction] and be 10-15 percent of the gross. We'll never see another person with this much firepower." The Sheik favors flexing his buying power at Keeneland's September and November sales. Those two can easily bring as much as $500 million in trades. That's why, even with disappointing final numbers this week, Keeneland officials are hopeful that 2010 will see them finish strong on the back stretch.